Three Rivers Press, 9780767923866, 256pp. Originally released by Doubleday in 1956, Harlem Moon Classics celebrates the publication with the fiftieth-anniversary edition of Billie Holiday’s unforgettable and timeless memoir. Updated with photos and with an insightful introduction and a revised discography, both written by celebrated music writer David Ritz. 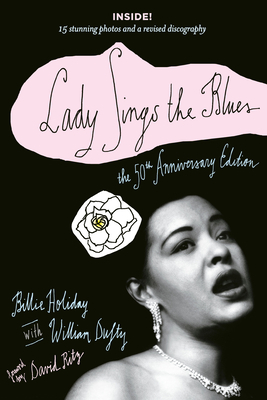 Lady Sings the Blues is the fiercely honest, no-holds-barred autobiography of Billie Holiday, the legendary jazz, swing, and standards singing sensation. Taking the reader on a fast-moving journey from Holiday’s rough-and-tumble Baltimore childhood (where she ran errands at a whorehouse in exchange for the chance to listen to Louis Armstrong and Bessie Smith albums), to her emergence on Harlem’s club scene, to sold-out performances with the Count Basie Orchestra and with Artie Shaw and his band, this revelatory memoir is notable for its trenchant observations on the racism that darkened Billie’ s life and the heroin addiction that ended it too soon. We are with her during the mesmerizing debut of “Strange Fruit”; with her as she rubs shoulders with the biggest movie stars and musicians of the day (Bob Hope, Lana Turner, Clark Gable, Benny Goodman, Lester Young, Coleman Hawkins, and more); and with her through the scrapes with Jim Crow, spats with Sarah Vaughan, ignominious jailings, and tragic decline. All of this is told in Holiday’s tart, streetwise style and hip patois that makes it read as if it were written yesterday. Eleanora Fagan, who later took the name BILLIE HOLIDAY, was born April 7, 1915, and died when she was just forty-four, on July 17, 1959. Coauthor WILLIAM DUFTY (1916–2002) was a music enthusiast, freelance writer for the New York Post, and Gloria Swanson’s last husband.